Designed by master artisan and mouthpiece model maker Gary Sugal, the SC III Black Hematite copper body alto mouthpiece is a versatile alto mouthpiece for today's saxophonist who plays pop, contemporary rock, and straight-ahead jazz and who aspires to the great sound Cannonball Adderley. Super Classic III BLACK Hematite builds on the powerful performance of the original Super Classic II.﻿﻿This is a precision machined, high-tech,CNC (Computer Numerical Control) metal alto mouthpiece with a clean swept laser table side rails The tip as well as the entire body of the mouthpiece have been laser enhanced to produce a precision controlled "non-nasal, non-gritty" projecting sound. The Super Classic III BLACK Hematite﻿ model features a solid pure copper body plated with Sugal’s proprietary Black Hematite finish. It also features Sugal’s precision machined parallel Mini Tracks™ which focuses the air flow, economically into the chamber, allowing the metal to breathe or expand for maximum resonation. 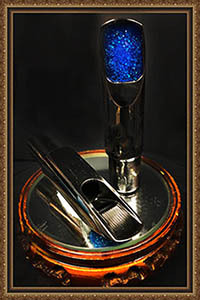 Aspiring musicians, young and old, will immediately notice that this mouthpiece is totally free-blowing and offers a rich, bright, powerful, center that generates lots of edge when called upon. The Super Classic III BLACK Hematite﻿﻿f eatures a medium to large size chamber and a rolled over snow-hill styled baffle allowing for a solid full bodied cutting centered sound. Reminiscent of the Cannonball Gerald Albright era the SCIII has an ease of playability and attains the altissimo register with ease. Players will find that the overall dynamics and blend of our preparatory natural 100% pure copper body eliminates brittle, nasal resonance found in competitive models while at the same time retains a very accurate and controlled intonation. Sugal’s proprietary “Black Finish Hematite” reflects outstanding resonance with a full body rich center sound. The SCIII is reminiscent of the “Cannonball Adderley” sound and blends in perfectly with todays’ all around aspiring jazz artist. Huge centered sound with spot on intonation. Easy of play, articulation is spontaneous. Body along with the side rails and tip rails are laser treated. A "bright" powerful center allows for lots of "bite"
Meticulously hand finished play tested by master artisan G.Sugal prior to leaving the factory.